I can’t believe how quickly the holidays snuck up on us! Since festive outfits are a popular request each year, I did a poll on Instagram asking whether you guys wanted to see more casual or professional / dressy looks. The votes were nearly split down the middle, so I’ll be showing both with ideas on how to tweak each look for different occasions! Today’s outfit is a simple but classic look with J.Crew Factory that can transition from a day at the office to a holiday event. These cotton tissue turtlenecks are awesome for layering, and I used a plaid cape scarf to add a festive touch and tie the solid colors together. And if you work in an office setting, you need this super affordable wool blend pencil skirt in multiple colors! In lieu of a skirt, you can swap in slim ankle pants for work or skinny jeans to make this casual. For a dressier look, I’d sub this gorgeous velvet wrap top (runs slim – xxs fits me well and is nursing friendly) tucked into the skirt, and finish with a pair of sparkly earrings. For another festive work option, you can recreate my holiday office look from a prior year with this current tartan button-up shirt, sidewalk skirt, and schoolboy blazer. I also wanted to share some gifting suggestions below that don’t break the bank! Stocking stuffer: Petite initial necklace. A personalized little trinket for under $10! Cozy combo on sale! : Their plaid patterns are so good this year! This plaid scarf makes a great everyday accessory (my favorite patterns are “ivory multi” or “juniper plaid”, whereas in comparison, this plaid blanket scarf is a thicker, more weighty option that could even be used as a throw. Pair one of these for gifting with a pair of shearling slippers and a pom cable hat – one of my favorite beanies from years ago! For the guys: Walker vest on sale!. This in navy is one of Nick’s favorite layering pieces, either over a flannel shirt or thermal tee, or under a jacket. He loves that it’s not puffy like down vests! Wool pencil skirt on sale!– true to size for the brand. 00 petite fits me well currently, but the waist will be a little big on ladies who are my pre-pregnancy size. The material feels plush and the skirt is fully lined. Measurements: 13″ across the waist, 17″ across the hips, 17.75″ length. Tissue turtleneck (also in stripes) – true to size. Full length sleeves are a tad long on petite arms but scrunches up easily. If you prefer a lower neckline and shorter sleeves, here’s a similar mockneck ribbed tee in a different material with 3/4 sleeves (hits bracelet length on me). Plaid cape scarf (5 patterns) – Since this is one size fits all, it’s an oversized casual fit on me when worn as a cape. The armholes can slide either higher or lower on your arms which helps adjust the fit from cape to shawl. It’s quite versatile, as you can also fold this down the center lengthwise (basically hiding the armhole slits) and style it like a regular scarf, as pictured above! Thank you to J.Crew Factory for partnering on this post. Always looking very beautiful and classy with your outfit looks! Hi Jean — have you tried machine washing the skirt? Or must it be dry cleaned? Thanks! Love these winter pieces Jean! You look great, I love the outfit! This skirt is sooo gorgeous <3 🙂 I'm absolutely in love with how you styled it with this green sweater! Love the look, comfy yet polished enough for work. What color are the tights? Thank you. How tall are you? Love the outfits! I feel like this is such a classic holiday look for you. Definitely thinking about getting the wool skirt! Love this outfit so much; the green turtleneck is especially beautiful. Thank you for linking other great J.Crew Factory items! I believe you said your tights are from Talbots. What size do you get? Hi Jean – Classy and timeless as always, I love this look and list you put together! I own listed sparkle earring and shearling slippers from previous season, I love and wear them heavily. JCF’s quality is wonderful! The color combination is so good! I like it! Your outfit is so classy!! Love the combination!!! You look great!!! I would love to see a post dedicated to winter business shoes. My entire professional career, I’ve been in the Deep South, and it rarely gets cold enough to be relevant for me. However, I find myself going on an increasing number of business trips to colder cities (DC, NYC, etc) and I just don’t even know what to do. 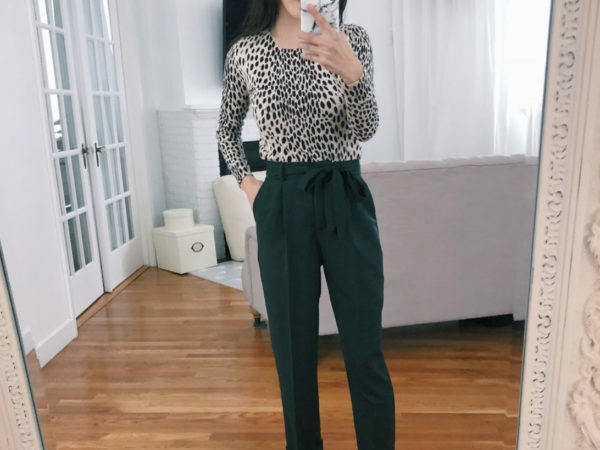 I love wearing Jcrew and Ann Taylor ankle length pants as I am 5’1”. However, these just don’t go well with booties. What can I wear that doesn’t show so much frozen ankle? Some time back, you gave a diy tip for helping keep this kind of shawl from constantly falling off your shoulders. I’ve looked for it and can’t find it. Am I dreaming it?